3 Nights at Hilton Moorea Resort Panoramic Overwater Villa 5 Nights at St Regis Bora Bora Superior Overwater Villa All flights From Los Angeles to Tahiti Islands. One complimentary Tropical Flower Turndown during stay. Butler Service Private villas located over the lagoon or on the beach offer butler service, terraces, outdoor showers, espresso/coffee makers, 42-inch plasma TVs, and Bose DVD/CD players. Surrounded by a turquoise lagoon, powder-sand beaches, and views of Mount Otemanu, this tranquil resort is located on secluded Motu Ome’e facing the main island of Bora Bora. The resort features a full-service spa on its own private island, a fitness center, three restaurants, a kids’ club, and an adults-only pool with a swim-up bar and private cabanas. Located on secluded Motu Ome’e just off the main island of Bora Bora, this tropical oasis unites luxury with breathtaking natural beauty. Set on 44 lush acres, the resort features stunning views of the turquoise lagoon, powder-sand beaches, and majestic Mount Otemanu. With an ambiance of carefree elegance, the resort attracts celebrities, honeymooners, couples, and families seeking a private getaway. Set on its own island, Miri Miri Spa offers unique Tahitian and Pacific Rim treatments that highlight native ingredients including pure mother of pearl and monoi oil. The resort also features an adults-only pool with a swim-up bar and private cabanas, a kids’ club, three restaurants, tennis courts, and a private helicopter landing pad. The open-air lobby of the Hilton Moorea Lagoon Resort and Spa has high Polynesian-style ceilings, with tour desks and reception on either side to service the international holidaymakers who frequent this resort. This area leads through to an open arrangement of restaurant pavilions and public areas clustered round the beach and pool, and shaded by coconut trees. Trickling pools filled with fat carp fish flow through tropical gardens and flowerbeds. A rustic Polynesian style of décor prevails throughout. The Hilton Moorea Lagoon Resort and Spa has a white-sand beach and adjacent infinity swimming pool. A variety of water sports are offered, as well as tennis courts and a fitness centre. A full-service health spa incorporates massage and treatment rooms, sauna and steam room, and hair salon. Several bars and restaurants all have lagoon views, as does a conference/function room. Tahitian black pearls are available at an on-site jewellery shop, and a gift shop offers newspapers, holiday clothing, and some basic necessities. Less than 20 km from the Hilton Moorea Lagoon Resort and Spa along a scenic coastal drive is the Tiki Theatre Village. This cultural centre, built in traditional Polynesian style, highlights aspects of local culture, from traditional tattooing and stone carving to cooking. In the evenings, Tahitian dinners and dance shows are a highlight. Arii Vahine – French, American, and Polynesian cuisines. Emphasis on seafood. Vegetarian alternatives. Buffet breakfast, à la carte lunch and dinner. Seafood buffet Saturday evenings with Polynesian show; Asian buffet Tuesday evenings. Open-air dining under pavilions with lagoon views. Open daily from early morning to late evening. Toata Bar -Continental breakfast and evening crepes and cocktails. Small circular bar under thatched roof with bar stools. Located on pontoon serving overwater bungalows. Open for breakfast and in early evenings. Eimeo Bar – Beer, wine, and cocktails. Bar snacks. Large oval bar adjacent to lounge with TV and two computers with wireless Internet access (surcharge). Open-air setup, with views over lagoon. Open evenings only. Rotui Bar & Grill – French, American, and Polynesian cuisines. Daily à la carte lunch; evening barbecue buffets except Tuesdays and Saturdays. Thatched, oval pavilion with bar stools. Tables under parasols along beach and near pool. Open for lunch daily and for dinner daily except Tuesdays and Saturdays. Breakfast Daily, free Internet (wifi), free mini bar (water, soft drinks, beer, refilled daily) and transfers. Set on the edge of a turquoise lagoon on the northeastern side of Moorea, white-sand beaches and lush mountain scenery surround this resort. Private overwater, beach and tropical garden bungalows feature furnished patios or balconies and contemporary Polynesian decor. The resort features a pool, day spa, private beach, water and beach sports, tennis courts, 2 restaurants and a poolside bar. Private bungalows are scattered over a calm turquoise lagoon, private white-sand beach and tropical gardens. Throughout the property, guests are treated to magnificent views of the lagoon, lush mountain scenery and the island of Tahiti. An idyllic retreat, the resort attracts couples and honeymooners from around the world. A variety of beach and water sports are available from the resort’s private beach including kayaking, sailing, snorkeling and scuba diving (surcharges may apply). The on-site day spa offers massage and body treatments that incorporate natural ingredients found throughout the island. Approximately 30 km (18.5 mi) from the resort is Belvedere Lookout, a must-see when visiting Moorea. Located high in the mountains, the lookout offers a stunning panoramic view of the island including Cook’s Bay, Opunohu Bay and Mount Rotui. PURE -Set in a contemporary decor, Pure enables you to enjoy your meal in a relaxed ambiance. K – Offering a mythical sight of the lagoon and of the island of Tahiti. Enjoy the world class cuisine K offers in an intimate and romantic setting while enjoying a Polynesian dance show (Te Vahine The Woman). Bars – VUE – Facing the lagoon and the swimming pool. Polynesian atmosphere. Exotic south Pacific cocktails. Snacks, ice cream counter. Weekly entertainment. Beachfront, sweeping views This Bora Bora hotel offers a secluded, picture-perfect setting on its own island surrounded by a turquoise lagoon. Guests enjoy sweeping views of the water, sunset, and Mt. Otemanu. Bora Bora Airport is just a 20-minute boat ride away. Soft sands, French flare Sofitel Bora Bora Private Island features a white-sand beach, a coral reef, a botanical garden, and a wealth of aquatic activities. The Manu Tiki restaurant showcases French cuisine, complemented by lagoon and mountain views. Private furnished terraces The hotel offers a choice of overwater bungalows, luxury lodge guestrooms, and luxury villas. All include private furnished terraces, signature Sofitel MyBeds, sofa beds, and plasma TVs. Wireless Internet access is available. On its own private island, this hotel provides boat service to and from Bora Bora Airport, 20 minutes away. Once guests arrive at the hotel, they’re treated to spectacular views of the lagoon and the jagged peaks of Mount Otemanu. Sunsets on this South Seas island are particularly romantic. Island Luxury overwater bungalow – The Island Luxury Overwater Bungalow direct lagoon access. The large terrace features panoramic lagoon views and a private outdoor shower. Inside, you’ll find a king bed or two twin beds with signature bedding, plus a living room with a sofa bed, plasma TV, DVD player, and minibar. WiFi is available. The bathroom features a rainfall shower head and bath amenities. Island Luxury Villa – Located on hillside of property offering views of the lagoon. This Villa is decorated in Polynesian style and is equipped with a terrace, private jacuzzi, sundeck, direct beach access, sun loungers, air conditioning, fan, safe, minibar and rainshower bathroom. Open for breakfast, lunch, and dinner, the Manu Tiki restaurant showcases French and international cuisine. The dining room is open to the fresh island air, and the views encompass the lagoon and mountain. Room service is available 24 hours a day. Take in the panoramic views of the lagoon and Mount Otemano while enjoying gourmet French and international cuisine at Manu Tuki. The restaurant’s high ceiling is crafted of pandanus wood, a local palm-like tree, and the room opens to the fresh air. A selection of fine wine and cigars are also available to enjoy. Manu Tuki Restaurant -Open for breakfast, lunch, snacks and à la carte dinner featuring French and Polynesian specialties. 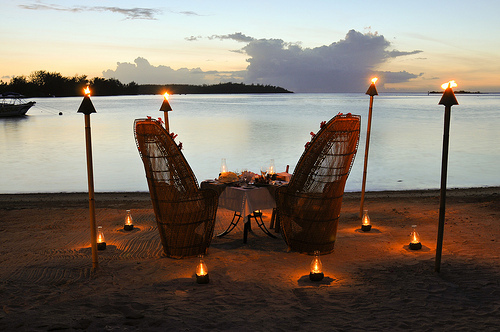 Linger over dinner and the beautiful views overlooking the lagoon and main island of Bora Bora. Mako Bar -Located on a terrace, adjacent to the restaurant, with 360-degree lagoon views, the Mako Bar features South Pacific and international cocktails, as well as a selection of cigars as well as snacks, ice cream, and picnic lunches. Open mid-morning till late evening. Sofitel Moorea Beach Resort consists of 114 private bungalows including 20 overwater bungalows. Guestrooms are appointed with contemporary Polynesian decor including wood floors and furnishings and canopy beds. Overwater bungalows feature in-floor windows to view the sea below. All bungalows have furnished patios or balconies. Amenities include minibars, BOSE sound systems, Sofitel “My Beds”, bathrobes, rain showers, blow dryers, iron & ironing boards, walk in closets (except Superior categories), magnifying mirrors, flat screen TVs, and wireless Internet access (surcharge). Superior Lagoon Bungalow – 330 sqf,eetExcellent beach front accommodations which feature a private patio with lounge chairs and outstanding views of the lagoon and resort’s private beach area. Spacious and bright, each fully refurbished bungalow is decorated with stylish contemporary furnishings, featuring air-conditioned, a king size bed with plush bedding, sofa bed, bathroom with separate rain shower. Luxury Garden Bungalow – 501 sq feet,Spacious and bright, each newly built room is decorated with stylish contemporary furnishings. Each bungalow opens to the beautiful landscaped gardens surrounding the resort with a private terrace and hammock. Each air-conditioned bungalow is beautifully designed; featuring a king size bed with plush bedding, bathroom with separate rain shower. Luxury Beach Bungalow – 501 sq feet,Excellent beach front accommodations which feature a private terrace with lounge chairs, hammock, outstanding lagoon views and direct access to the resort’s private beach area. Spacious and bright, each newly built bungalow is decorated with stylish contemporary furnishings, featuring air conditioning, a king size bed with, plush bedding, bathroom with separate rain shower. Superior Overwater Bungalow – 330 sq feetThe resort’s Overwater accommodations are a favorite among staff and guests alike. Each fully refurbished bungalow features an in-floor viewing platform, illuminated at night, so guests can enjoy the colorful fish swimming underneath. Additionally guests will enjoy the spacious deck with privacy fence and direct access to the lagoon below. Each air conditioned bungalow is beautifully designed featuring a king size bed with plush bedding, sofa bed, bathroom with separate rain shower. Luxury Overwater Bungalow – 554 sqfThe resort’s overwater accommodations are a favorite among staff and guests alike. Each newly built Deluxe Overwater Bungalow features an in-floor viewing platform, illuminated at night, so guests can enjoy the colorful fish swimming underneath. Guests will enjoy the spacious deck with privacy fence, sun loungers and direct access to the lagoon below. Each air conditioned bungalow is beautifully designed featuring a king size bed with plush bedding, bathroom with separate rain shower. Recreational opportunities at the resort include boat excursions, kayaking, pedal boating, sailing, snorkeling, scuba diving, water skiing, wind surfing, horseback riding, tennis, and an 18-hole golf course nearby, and bicycle rentals (surcharges may apply). Located on one of the resort’s three private beaches, a water-sports activity center offers kayaks, windsurfers, boating excursions, and snorkeling and scuba diving gear (surcharges may apply). Guests also have access to the recreational facilities at the nearby Sofitel Marara hotel, which include a fitness center, tennis court, and outdoor pool.The recreational activities listed below are available either on site or near the hotel; fees may apply. French, American, and Polynesian cuisines. Emphasis on seafood. Vegetarian alternatives. Buffet breakfast, à la carte lunch and dinner. Seafood buffet Saturday evenings with Polynesian show; Asian buffet Tuesday evenings. Open-air dining under pavilions with lagoon views. Open daily from early morning to late evening. Continental breakfast and evening crepes and cocktails. Small circular bar under thatched roof with bar stools. Located on pontoon serving overwater bungalows. Open for breakfast and in early evenings. Beer, wine, and cocktails. Bar snacks. Large oval bar adjacent to lounge with TV and two computers with wireless Internet access (surcharge). Open-air setup, with views over lagoon. Open evenings only. French, American, and Polynesian cuisines. Daily à la carte lunch; evening barbecue buffets except Tuesdays and Saturdays. Thatched, oval pavilion with bar stools. Tables under parasols along beach and near pool. Open for lunch daily and for dinner daily except Tuesdays and Saturdays. French-influenced cuisine with Polynesian flavours. Open daily for lunch and dinner. Outdoor beach and poolside dining. Boat that was used in Mel Gibson’s Mutiny on the Bounty is the centerpiece of the buffet. Polynesian dance show on Wednesday nights. Serves beer, wine, and cocktails. Take advantage of the suite’s wine cellar, minibar, Nespresso machine and two bathrooms. Lagoon views or the majestic mountain views of Moorea. Bungalow with waterside sun-deck, lagoon & island view, glass floor viewing panel. VIEW – The lagoon/island views, private waterside balcony -BED OPTIONS -One king bed. Soak in stunning views of the island and lagoon from the private waterside balcony of this overwater villa. Relax on the outdoor catamaran nets. The villa boasts a king bed and a separate seating area. Most activities on Bora Bora are based on organized excursions that can be booked through the resort. These include trips on the lagoon by submarine or glass-bottom boat; excursions to swim with sharks and sting rays; scuba diving and snorkeling; and sunset cruises, all designed to showcase the magnificent lagoon. Fishing, parasailing, water skiing, and sailing are other lagoon-based options. Jeep and quad safaris, horse riding, and four-wheel driving excursions penetrate the island’s mountainous interior. It is also possible to rent bicycle or scooters in Vaitape, the island’s main town. The recreational activities listed below are available either on site or nearby; fees may apply. The St. Regis Bora Bora features 100 villas located over the lagoon or on land facing the ocean. Designed with contemporary Polynesian furnishings and décor, the villas feature outdoor showers and terraces overlooking the lagoon, surrounding islands, or ocean. The villas also feature signature St. Regis Butler Service. Beach lovers will adore vacationing in the Beachside Villa with Pool, for each of the five villas here at the resort offers direct access to the gorgeous white sand. Settle into a lounge chair and drink in the views of the island’s famed lagoon, then take a dip in either the villa’s private plunge pool or head straight out into the warm turquoise waters, snorkel gear in hand. Each villa is also enhanced with a completely private, walled-in tropical garden that includes an outdoor shower set in the midst of the lush foliage.With direct access to the powdery sands and turquoise blue waters of the beach, our Pool Beach One Bedroom Villa offers gracious separate living rooms, a private outdoor garden with exclusive shower and Plunge Pool. Each of the four available Beach/Pool Villas is 1,636 square feet. Every Overwater Deluxe Islandview Villa at The St. Regis Bora Bora Resort is an oasis of calm beauty, looking out at an angle across the celebrated turquoise lagoon at the main island of Bora Bora. Mostly located at the far reaches of the overwater pontoons, each of the 19 villas encompasses 1,550 square feet (144 square meters) of tropical elegance and secluded privacy with interiors tastefully designed with noble exotic woods. These villas accommodate up to three people. Featuring a spacious, private terrace with whirlpool; covered gazebo complete with daybed; private pontoon and outdoor shower—our Premier Overwater One Bedroom Villas invites you to discover the true meaning of serenity. These accommodations are 1,905 square feet. Eight Premier Over Water Villas are available in this category. Each of the seven Oceanfront One Bedroom Pool Villas is 2,702 square feet of sprawling enchantment. From the private plunge pool to the outdoor garden, to the exclusive shower and pontoon area—our Premier Beach/Pool Villa offers direct access to Bora Bora’s natural beauty, as well as the beach. Continually captivating. With breathtaking views of the neighboring islands of Raiatea and Taha’a, our Royal Oceanfront Two Bedroom Pool Villas unfolds into an ultra-private, two-bedroom haven featuring its own private garden and secluded infinity edge pool. The two villas in this category are each 2,852 square feet. Spacious and completely private, each of the two Reefside Royal Garden 2-Bedroom Villa with Pool available at The St. Regis Bora Bora Resort is a spectacular home away from home, with breathtaking views of the Pacific Ocean and sunrise over the nearby Tahitian islands of Taha’a and Raiatea in the distance. The air-conditioned villa consists of two bedrooms and two baths, with a large central living area located between the bedroom/bath combinations. Each bathroom is done in Italian marble and has a full bath, separate shower and double sink looks out into the lush private walled tropical garden; and each has a beautiful outdoor shower as well. Both bedrooms also open onto a massive terrace constructed with coral-pink hued stone, leading to a large swimming pool (20 x 16 feet or 6 x 5 meter) that looks out across the ocean. With a total dimension of 3,961 square feet (368 meters) these two villas are some of the most spacious villas available at the resort. They hold six people and are just steps away from Spa Miri Miri by Clarins, the award-winning spa from Clarins that sits on its own private island in the middle of the Lagoonarium, where protected snorkeling is a delight to be had. Distinct in every detail, the Royal Estate is comprised of three separate pavilions that revolve around a private pool. It boasts three beautifully appointed bedrooms, two luxurious living rooms, a chef’s kitchen, and dining room with sunset terrace. This suite also features a private spa area with treatment room, sauna, hammam and whirlpool. Magnificent tropical gardens border its private white sand beach. The Royal Estate at The St. Regis Bora Bora Resort is 13,000 square feet. Dining Room Chef’s Kitchen Private Spa Private Beach Private Pool Whirlpool. The Royal Estate sleeps 9 people and includes dedicated bespoke St. Regis Butler Service™. A private chef is available on request. On the verdant island of Moorea, this Papetoai resort near Opunohu Bay features a private beach between the island’s mountains and the lagoon. The public market at Pao Pao is 10 km (6.2 mi) away. InterContinental Resort and Spa Moorea offers the full-service Hélène Spa, nestled in the resort gardens. Guests can interact with dolphins at the Moorea Dolphin Center in the resort lagoon. At InterContinental Resort and Spa Moorea, guest accommodations feature private terraces or balconies with tables and chairs. Rooms include televisions as well as high-speed Internet access. Very Active Resort, Many Activities & Excursions are set-up at this resort. Dazzling, large bungalows, beautiful marine scenery and a lush green mountainside is what guests will find at the InterContinental Moorea Resort & Spa. A gourmet restaurant and terrace that overlooks the resort pool and lagoon, and a convenient swim up bar will also help make your stay an enjoyable one. Recent renovations have been completed on the property adding private pools, an extension of the terraces with an entertainment area, lower sundeck with shower and direct access to the lagoon as well as a gazebo. Another resort highlight is the impressive two-level infinity pool just steps away from the beach. The 17 new Garden Pool Bungalows, which are set back from the lagoon, with each featuring a large terrace with a private plunge pool and outdoor lounging and dining areas (called a Fare Pote). At 721 square feet, they feature a king-sized bed plus a living room with sleeper sofa that can accommodate two additional guests. The resort’s 28 Beach Bungalows, which are scattered amid coconut trees on the beach at the edge of the lagoon (11 of them considered Premium because of their more private location), also benefited from the spruce up with the extension of their terraces to include a thatch-roofed Fare Pote dining area with a table and chairs. They are 409 square feet and also feature king-sized beds and sleeper sofas. Lanai Room –Lanai Rooms are located in the main hotel building and these are closer to the central core of resort facilities. They are comfortable and spacious, with terraces or balconies that give on to the luxuriant resort gardens. Suite Garden Bungalow –The Suite Garden Bungalow is located throughout the gardens. They feature a separate living area, large bathroom and private furnished terrace. Suite Bungalow Beach –The Suite Bungalow Beach are situated on a white sand beach gently sloping into the lagoon, under the shade of the coconut trees. They feature a separate living area and large bathroom. Suite Bungalow Beach Premium –The Suite Bungalow Beach Premium are situated on a white sand beach gently sloping into the lagoon, under the shade of the coconut trees. They feature a separate living area, large bathroom and private furnished terrace. Suite Bungalow Overwater –The Suite Bungalow Overwater are located around a series of green islands (motu in Tahitian). They are the largest bungalows available on the property, featuring a separate living area and a private furnished terrace with direct access into the lagoon for swimming. Suite Bungalow Overwater Premium –The Suite Bungalow Overwater Premium are located around a series of green islands (motu in Tahitian). They are the largest bungalows available on the property, featuring a separate living area and a private furnished terrace with direct access into the lagoon for swimming. The InterContinental Moorea Resort and Spa offers all the usual water-based activities available in Tahiti: free snorkeling, kayaking and outrigger canoes, plus extra-cost excursions such as para-sailing, water-skiing, Wave Runners, scuba diving and shark and ray feeding. Also on-site is the Moorea Dolphin Center, where guests can interact and pose with a trio of playful bottle-nose dolphins by signing up for a 30-minute or one-hour program (at an extra cost). Turtle fans can also visit the Turtle Cat Centre, a clinic designed to rehabilitate sick or wounded green and hawksbill sea turtles. Set in a lush tropical setting on a private beach, this resort is three km (two miles) from Cooks Bay and Opunoho Bay. All guestrooms, located either above water or nestled in the gardens, include private balconies and exotic wood floors and furnishings. Arii Vahine Restaurant, adjacent to the lagoon, serves Polynesian and International cuisine with panoramic ocean views. Located on secluded Motu Tehotu between a crystal-clear lagoon and the Pacific Ocean, this luxury resort offers gourmet cuisine and a range of recreational opportunities. Guests can enjoy water sports at the private beach, relax at the spa, swim in the infinity pool, or work out at the fitness center; 2 restaurants and 2 bars are on site. Guests can take advantage of numerous water sports at the private white-sand beach or simply relax with a tropical beverage alongside the infinity pool. The full-service spa offers relaxing facials, massages, and body treatments (surcharge), and the open-air fitness center features classes such as Polynesian dance and sunrise yoga. Other features include a kids’ club, an activities center for teens, a concierge desk, and 24-hour room service. The Bora Bora Lagoonarium, located 15 minutes from the resort by boat, is an outdoor aquarium with turtles, sharks, rays, and other marine life. Accompanied by experienced guides, guests have the rare opportunity to swim and interact with these fascinating sea creatures. VIEW – Large & independent bungalow with private pool & terrace -BED OPTIONS -One king bed. Polynesian-style bungalow in our lush gardens, with beautiful views of the beach or garden. The bungalow features one king bed, wood laminate flooring, a private terrace with plunge pool and convenient amenities.